Since cabbage grows so easily (and big!) 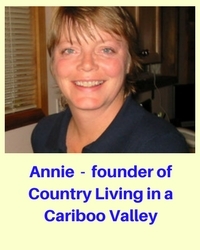 here in the Cariboo, we often end up with heads over 10 pounds. 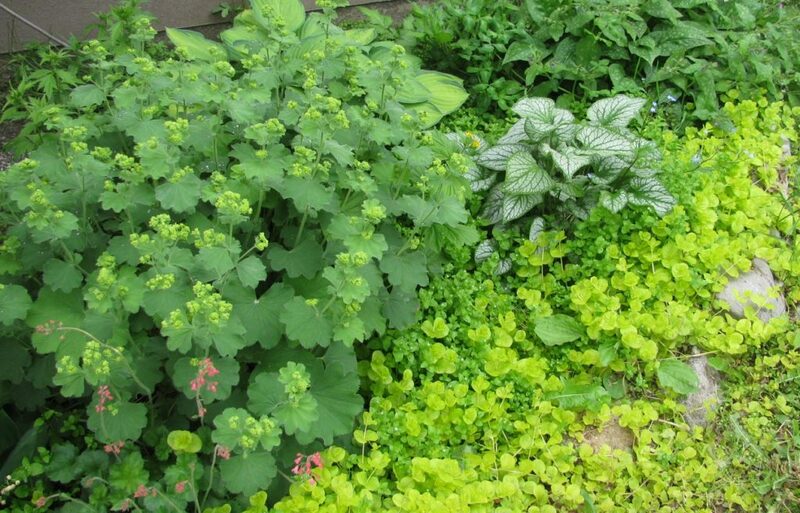 What to do with all that cabbage? That’s easy – we turn it into Sauerkraut. We love having jars of home canned kraut on hand for a quick meal in the winter. Here’s how to make Sauerkraut (and how to can it too). We do keep several heads in the Cold Room and they will easily keep down there until past Christmas with no problems. 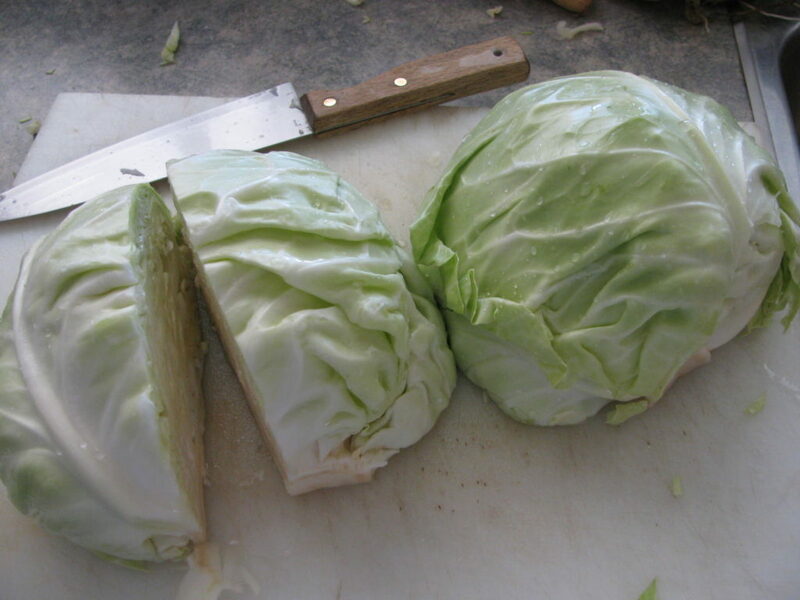 Just peel off the outer layer and discard it before cutting up the cabbage. Coleslaw is often on our dinner table here in the Fall. We mix the red and green Cabbages together, grate some Carrot, add a few raisins or cranberries and put dressing all over it. We probably eat Coleslaw at least three times a week. I also love decorating with my crocks (one even holds our woodstove kindling). 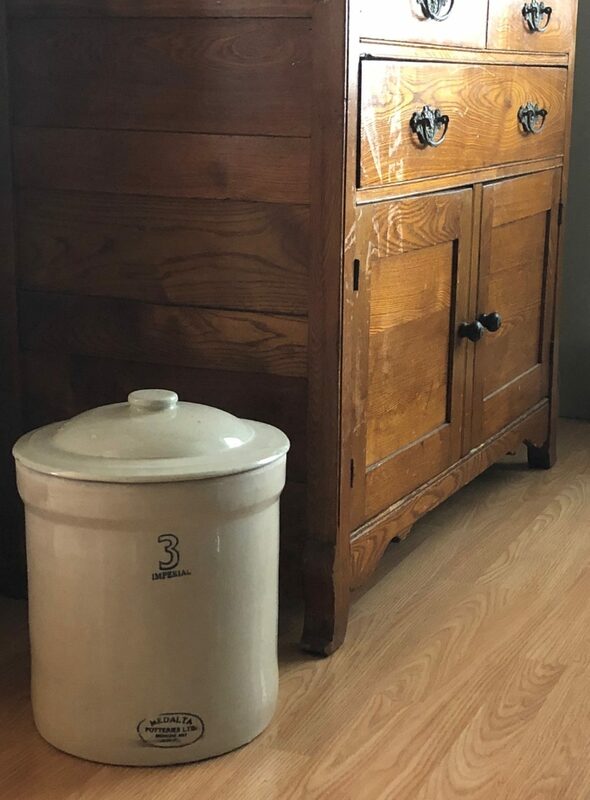 Here’s my 3 gallon alongside the dining room sideboard. I’ll just borrow this one for a few weeks and start fermenting cabbage. For this recipe, I need 6 tablespoons of coarse pickling salt for every 10 pounds of cabbage. If you have a crock and don’t know how much it will hold, the general rule is 5 pounds of food for every 1 gallon of crock capacity. Our 3 gallon jug crock should hold 15 pounds of cabbage. 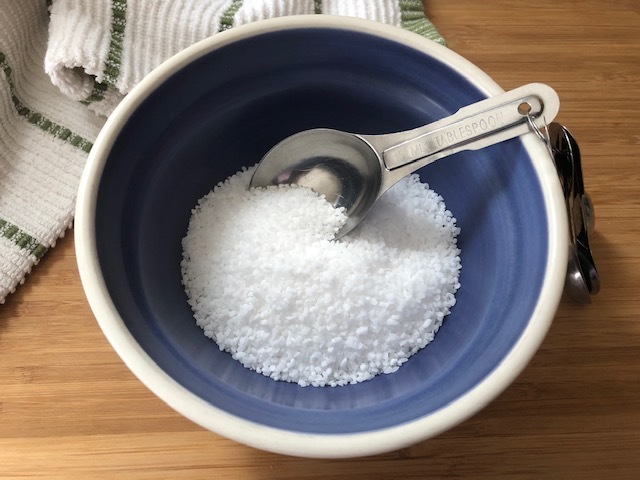 So I need and measure out 9 tablespoons of the pickling salt. Wash the cabbage, taking off the looser outer leaves. Start with a nice tight head of cabbage, then cut the cabbage in half. Do it again, so you have four pieces, and cut out the core from each. 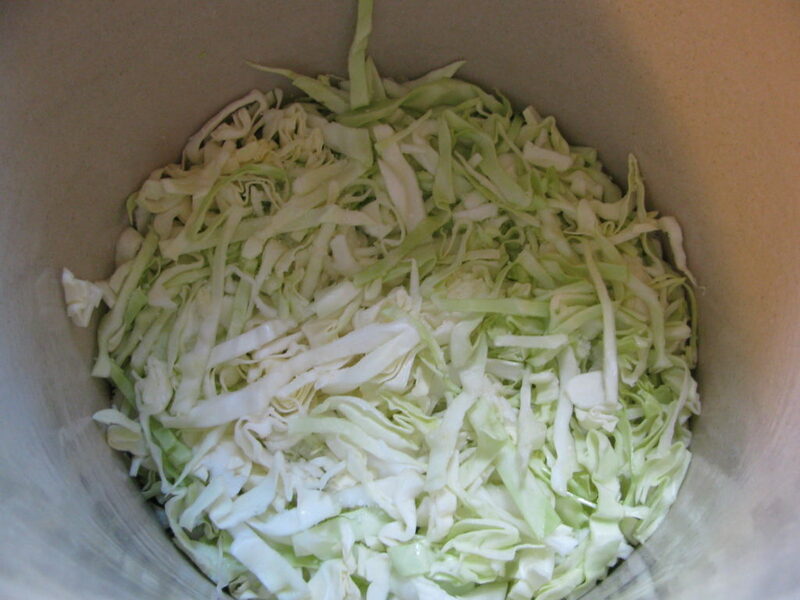 Slice the cabbage (or use your food processor to finely shred) very thin, weigh it and then put a layer in the crock. I just slice our thinly with a good kitchen knife. It doesn’t take long to get several heads of cabbage all ready for the crock. 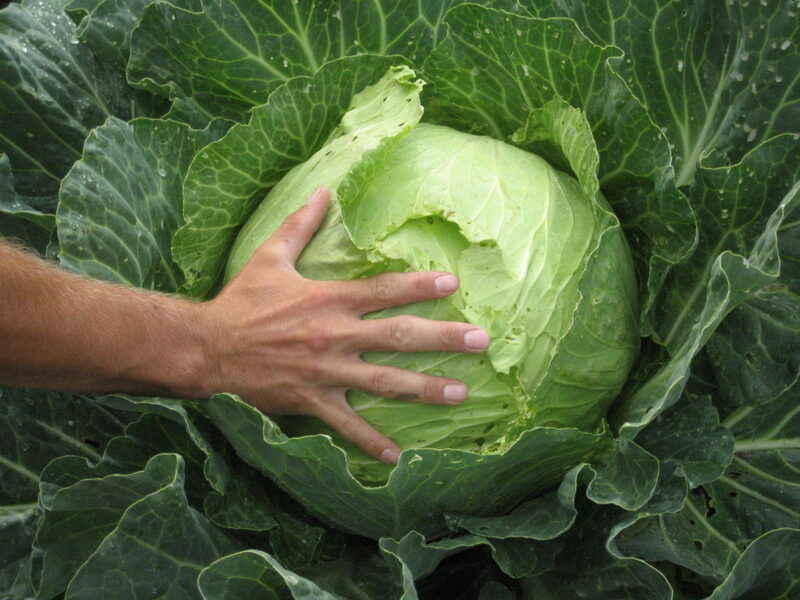 As the cabbage is layered, pat it down firmly with your hand to remove as much air as possible. On top of EACH layer, sprinkle some of the pickling salt. Alternate Cabbage and the salt until your crock is almost full. Once my layers started getting higher, I used the bottom of a coffee cup to firmly pack the Cabbage down. 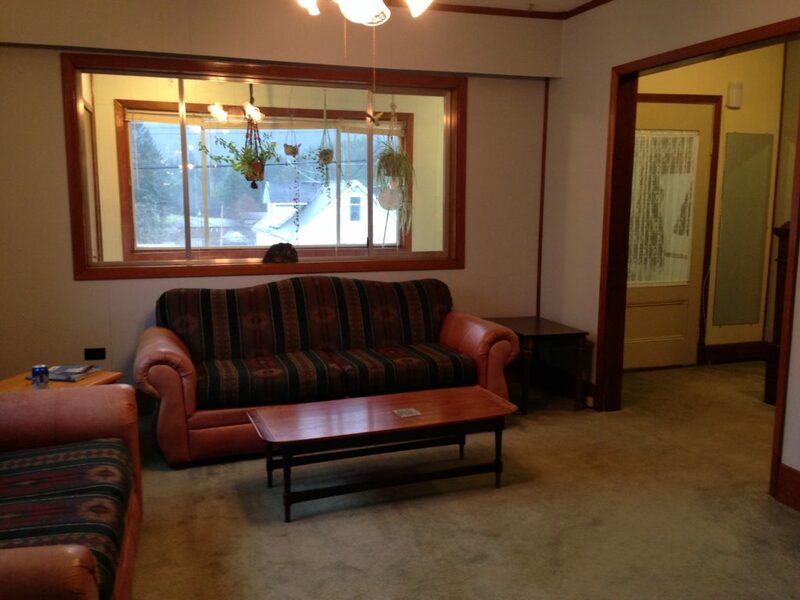 I want as little air in there as possible. REALLY squish that Cabbage down! 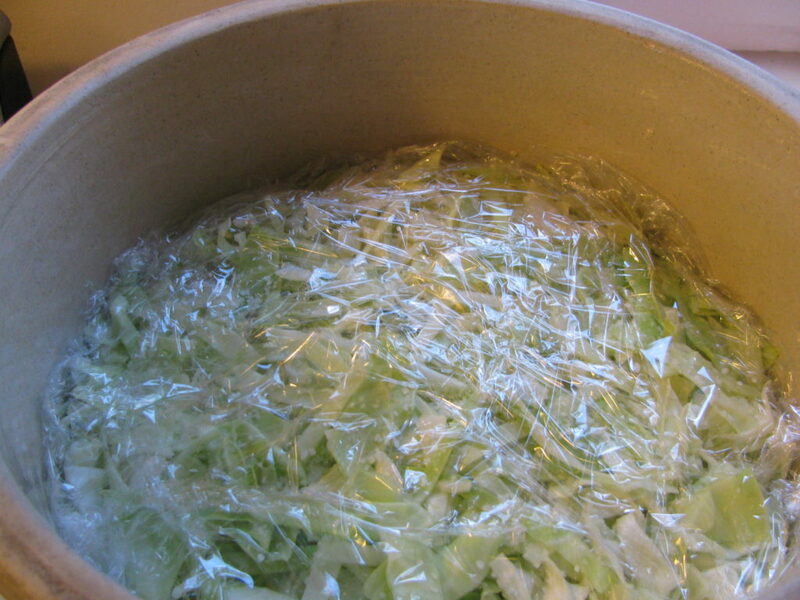 Once you’ve got your Cabbage and salt layered in the crock, tear some plastic wrap and place it on top, tightly tucking it down the sides if possible. If you have to, tear more plastic wrap and just jam it around the edge of the crock. Remember, you want zero air coming into contact with the Cabbage! No air at all. 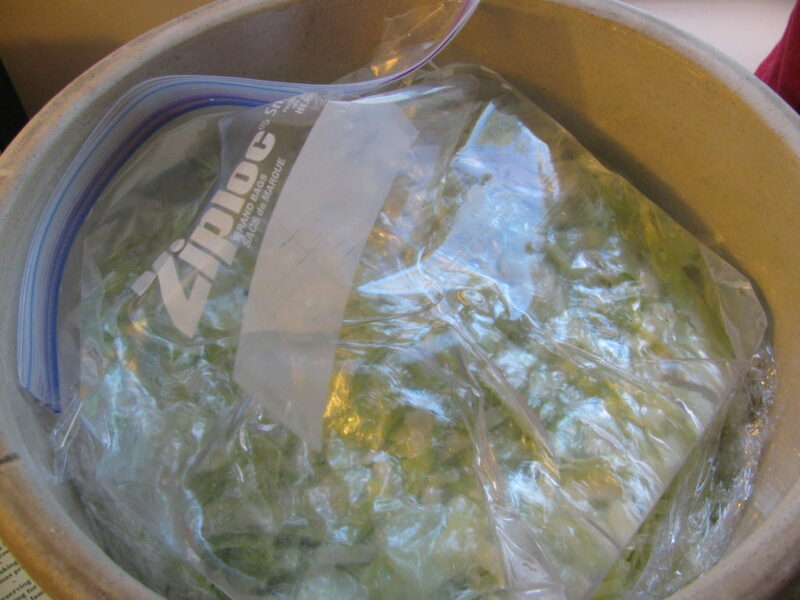 Now take a plastic freezer bag 3/4 full of cold water and set that directly on top of the plastic wrap. The bag will find any open areas and sit on top of it, hopefully removing ALL air at the top. Put the cover on your crock and leave it alone for a couple of weeks. Check it every few days – there should be no scum sitting on the top. If there is, take a spoon and carefully remove it. Make sure you put fresh plastic wrap on top. After it has stopped fermenting, it will be ready for canning. 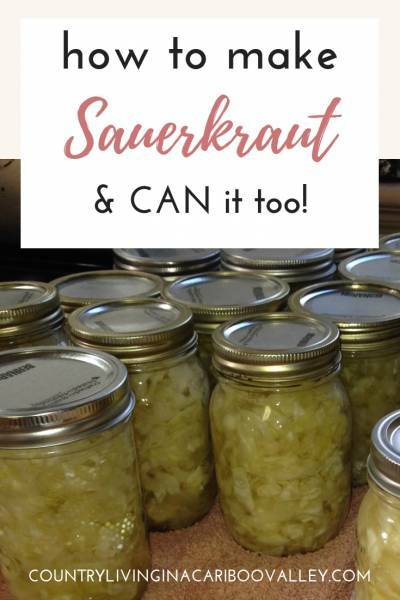 I’ve put a link below to my post all about how to do the canning of your Sauerkraut. For fermenting, you want a temperature of 68 – 72F or 20 – 22C. Try making some Sauerkraut for your family! You can use glass jars, if you don’t have a crock. Don’t use anything metal and never mix fresh cabbage in with cabbage already fermenting. After it’s ready, you will probably want to read about how to water bath can Sauerkraut. It is easy to do and great to have some jars on your pantry shelf! Want to learn more about how to grow cabbage? Oh the Gman loves cabbage rolls…he usually makes a batch or two, then puts them in the freezer with just a few in each bag. Hopfeully I will get the followup post for Sauerkraut up tomorrow. Kari, have you started some? I like the idea of using the zip lock bag to help ‘seal’ the top. That beats the plate and rock or brick to hold it down!